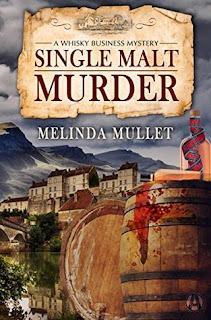 In no shape, form or fashion is it evident that SINGLE MALT MURDER is Melinda Mullet’s first book. A setting that makes you wish you could live there, a solid well-constructed mystery, complex characters, and the chance to learn about a topic that isn’t one you encounter every day. Abi and Grant both start off on the prickly side but warm up nicely. Their attraction simmers in the background, never dominating. Personally speaking, that’s a good thing. Balfour, the Haven, and Abby Glen all made me long to hop a plan and relocate. Abby Glen is a distillery for single malt whisky, and as such there are details about the process and a few historical tidbits. Interesting, but if you’ll have to discover the difference between whiskey and whisky on your own. Whoduunit and why kept me on my mental toes and kudos to those who figure out every detail. I certainly didn’t, but that’s half the fun, isn’t it? Ms. Mullet has set the bar high for her follow up. If SINGLE MALT MURDER is anything to judge by, she should meet the challenge handily. Looking forward to my next trip to Balfour.